My name is Lhakpa Dhondup. 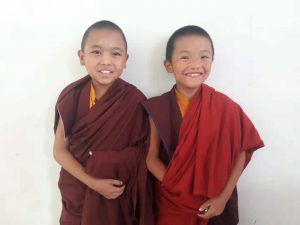 I and my brother Thrinley are studying at Takdah Diwakar Buddhist School in Darjeeling India. We are originally from Dolpa Kharpa (It is a very small village, not known by many people). My mother’s name is Palsang and my father’s name is Pema. Nowadays my mother stays alone, they sseparated long time before. Due to my father’s drinking habit, my mother had to face so many troubles in her life. We all siblings are with our mother. My mother was worried about how she could feed us with that situation. She had no idea, what’s next coming on her and she came to Kathmandu. With some kind people’s help, we were first sent to Karma Raja Maha Vihara monastery Swayambu. There was a monk from Dolpa who really helped us to reach here at Takdah (Diwakar Buddhist School). We miss our family but at the same moment, we have another family here at Diwakar Buddhist School. We get knowledge, place to sleep and foods also, but more important, we get love of family and friends here. We both are very happy here. We are so grateful and feel lucky to be here. With the blessing of H.H Karmapa and H.H. Shamarpa, we get all the facilities here.